Less than six months ago, I stood in front of the T.C. Williams Swim & Dive Boosters meeting and excitedly reported on the progress for the new 50-meter pool at Chinquapin. It’s a done deal, I announced proudly. It’s REALLY going to happen! After four years of advocating for a long-overdue new pool, the hard work to convince our elected officials to fund it is done! Indeed, the City Council had voted the previous May to include $4.5 million in the FY 2017 budget for the design and early construction phase of the project, and $15 million in FY 2018 for completing the construction. The City signed a Memo of Understanding with Advocates for Alexandria Aquatics (AAA) to form a “public-private partnership.” Under the agreement, AAA committed to raise $2.5 million to round out the funding for the project. The plan at that time called for the pool to be completed by December 2018 or so. After the meeting at T.C., several parents gathered around to offer their congratulations and to ask questions. Around that same time, after several weeks of working closely with City staff, AAA had just committed to pay for a marketing study by a sports marketing firm that would quantify the advertising value to potential private-sector donors who might help underwrite the project. AAA’s financial advisers had suggested that such a study would be helpful to our fund-raising efforts, and, in fact, the study validates that the new pool could generate streams of revenue into the future to help cover operating costs. Did anyone in City government think to share with their private-sector partner the possibility that the design contract would be “paused” before AAA committed those funds? Apparently not. AAA has taken its role in the public-private partnership very seriously. Determined to make sure that the new pool, unlike the current pool at Chinquapin, is built to proper specifications and takes advantage of the latest technologies, board members have spent countless hours consulting with experts in the pool construction field, including USA Swimming and Myrtha Pools. We have visited aquatics facilities as far away as Christiansburg, Va. and Greensboro. N.C., oftentimes accompanied by City staff. We’ve also been to see pools closer to home such as Takoma Park in D.C. and the Edward T. Hall Aquatic Center in Calvert County. We also worked with the City’s consultants to suggest ways to cut nearly $8 million from the initial estimates of the pool cost. Since the “pause,” AAA has met with the Mayor, every other City Council member and the City Manager to propose ways to remove the pause and allow the project to go forward on the original timetable. We have identified 32 other proposed capital projects totaling more than $23 million that could be delayed one or two years so that pool construction could move forward on schedule. We recently commissioned a survey of Alexandria residents to gauge the extent of support for a new pool. 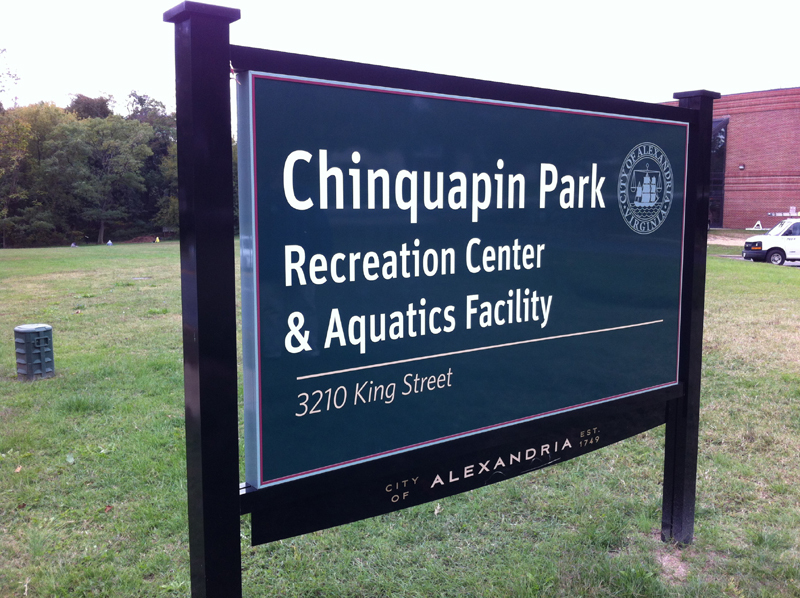 The results: Fully two-thirds of city residents support a new 50-meter pool at Chinquapin. We have continued to work with ACPS on a pilot project to provide water safety instruction to students at one elementary school in the hope that the pool will someday be built and that an estimated 7,500 children in Alexandria who don’t know how to swim will someday acquire this essential life skill. AAA continues to support the Chinquapin Advisory Council’s Family Splash Nights, which attract hundreds of families, including many who have never visited Chinquapin before. This Friday night from 6:00 to 9:00 p.m., members of the Howard University swim team will be there to demonstrate strokes and relays, and to work with children. Meanwhile, the existing pool at Chinquapin is as crowded as ever, at times to the point of being unsafe. Area high school swim teams will still need to commute to Fairfax County and elsewhere for practices and meets. Families on the wait list for swim classes will continue waiting or go elsewhere. Organizations that currently rent pool space would like to rent more lanes and other organizations that are shut out of Chinqaupin are still hoping to rent space in a new pool. Construction costs keep rising, so a delayed pool will cost more. These are the lessons I’ve learned from this experience: We don’t really have a 10-year Capital Improvement Program. We don’t even have a one-year capital spending plan, if the projects that are approved by the City Council for that same year are subject to arbitrary deletion with the budget office’s red Sharpie (a practice, I should add, that City Council has criticized ACPS for in past years). We also don’t have, I am sad to say, a City government that truly wants to cultivate public-private partnerships for mutually-beneficial projects across the city as it has long maintained. How will I respond when someone comes to me with a can-do attitude and says “I want to help the City accomplish a big goal that I don’t think they could achieve on their own”? My advice, born of this experience: Be wary. Don’t put your heart into it. Don’t get wrapped up in it. And by the way, you might want to think about whether you have something better to do with your time. They let me down, and they let down the most committed, selfless, energetic group of citizens I’ve ever had the privilege of working with, led by the dedicated and intrepid Bill Rivers, chair of AAA since its inception. The repercussions of putting the pool on indefinite “pause” will dog the City for years to come, and our City government may never know the lasting damage that has been done. True partners don’t withhold key information from each other, and true partners understand that commitments are meant to be kept, and trusted, and valued. The final lesson I’ve learned? To never again stand in front of a group of my peers and declare that the City will make good on a promise until the spade is in the ground.